Kent Davis (mac4kent) added a comment to T63774: Cycles and EEVEE on Mirror Blender 2.80. Aza (azagwen) created T63791: Subsurface modifier new "OpenSubdiv" method Issue. Acrivec Cevirca (Acrivec) updated the task description for T63789: Generated noise texture is not infinite / looped . Johannes Lübke (johannes.l) created T63790: Crash when applying Scale of Object with vertex parent. Acrivec Cevirca (Acrivec) created T63789: Generated noise texture is not infinite / looped . Michael Soluyanov (crantisz) created T63788: Blender crashes when the particle system is turned off in particle editing mode. laiden day (laiden) added a comment to T63771: Black scene and random crash . until its gone and or black screen altho pulling up the user preferences brings up the blender not responding panel b4 i can use it. Loïc Pinsard (Muream) renamed T63785: Evaluation issue when driving a parent's transformation by the opposite of its child's transformation. from Evaluation issue when driving a parent's transformation by the inverse of its child. to Evaluation issue when driving a parent's transformation by the opposite of its child's transformation..
klolik created T63787: Segmentation fault or incorrect behavior with `Intersect (Knife)`. Acrivec Cevirca (Acrivec) added a project to T63786: Setting camera position changes object's transform: BF Blender: 2.8. Acrivec Cevirca (Acrivec) added a comment to T63786: Setting camera position changes object's transform. After deleting the plane and trying to set camera view - nothing happens. However, when I shift-C - it starts working again, so I guess shift-C is a part of this bug. Acrivec Cevirca (Acrivec) created T63786: Setting camera position changes object's transform. Yu-sion (Yu-sion) added a comment to T63698: Selecting Materials after creating a new file throws EXCEPTION_ACCESS_VIOLATION. Thank you, @Brecht Van Lommel (brecht), commit c8fc23fdbe0 has fixed the reported issues with materials, lookdev, and rendered. Loïc Pinsard (Muream) created T63785: Evaluation issue when driving a parent's transformation by the opposite of its child's transformation..
Christopher Anderssarian (Christopher_Anderssarian) added a comment to T63772: Movie Clip Editor fails to show/hide toolbar. That's fine :) If you plan to fix bugs you are more than welcome to get involved. P.S. Thank you very much for the footer. This is going to help so much. George Vogiatzis (Gvgeo) added reviewers for D4714: UI: Keep timeline closed when resizing window. : Campbell Barton (campbellbarton), Brecht Van Lommel (brecht). George Vogiatzis (Gvgeo) added reviewers for D4711: Remove redundant screen_refresh_headersizes function. : Campbell Barton (campbellbarton), Brecht Van Lommel (brecht). George Vogiatzis (Gvgeo) claimed T63772: Movie Clip Editor fails to show/hide toolbar. George Vogiatzis (Gvgeo) added a comment to T63772: Movie Clip Editor fails to show/hide toolbar. George Vogiatzis (Gvgeo) created D4718: FIX: Movie Clip Editor fails to show/hide toolbar. Brecht Van Lommel (brecht) closed T63783: Cycles volume density node not working as Archived. The shader node setup seems to be wrong, the color ramp alpha output should not be used as density, with this color ramp it is 1.0 everywhere. Instead the color output should be used as density for both volume nodes. Tiago Marinho (tiagomeraki) updated the task description for T63784: Diffuse becomes black when connecting a transmissive Principled BSDF to a Mix Shader node in EEVEE. Tiago Marinho (tiagomeraki) created T63784: Diffuse becomes black when connecting a transmissive Principled BSDF to a Mix Shader node in EEVEE. David R B (David_dd) created T63783: Cycles volume density node not working. Doug Hilton (DougWorld) closed T63782: Toggle Quad View displays feet instead of inches in upper right quadrant (User Persp) as Resolved. Doug Hilton (DougWorld) added a comment to T63782: Toggle Quad View displays feet instead of inches in upper right quadrant (User Persp). Doug Hilton (DougWorld) created T63782: Toggle Quad View displays feet instead of inches in upper right quadrant (User Persp). yves bodson (yvesbodson2) added a comment to T63781: Alt-M for merging vertices bail out . yves bodson (yvesbodson2) created T63781: Alt-M for merging vertices bail out . Brecht Van Lommel (brecht) triaged T63771: Black scene and random crash as Needs Information from User priority. This is not enough information for us to investigate the issue. We really need a .blend and exact steps to reproduce the issue, otherwise there is nothing for us to go on. Brecht Van Lommel (brecht) triaged T63774: Cycles and EEVEE on Mirror Blender 2.80 as Needs Information from User priority. For Eevee, you need to manually enable effects like screen space reflection, and add light probes for more accurate reflections. Brecht Van Lommel (brecht) added a comment to T63512: crashes when clicking screen space reflections . Brecht Van Lommel (brecht) added a comment to T63698: Selecting Materials after creating a new file throws EXCEPTION_ACCESS_VIOLATION. Thanks for tracking down the commit. I committed a fix, but I was not able to reproduce myself so please test if it actually worked in the next build. Brecht Van Lommel (brecht) added a comment to T63760: Crashes while rendering or changed to lookdev mode. This one is a duplicate of T63698 (the errors are the same). Brecht Van Lommel (brecht) merged T63760: Crashes while rendering or changed to lookdev mode into T63698: Selecting Materials after creating a new file throws EXCEPTION_ACCESS_VIOLATION. Brecht Van Lommel (brecht) merged task T63760: Crashes while rendering or changed to lookdev mode into T63698: Selecting Materials after creating a new file throws EXCEPTION_ACCESS_VIOLATION. takaaki takeda (popqjp) created T63779: Set origin (Origin to 3D cursor) for parent object moves child objects. Brecht Van Lommel (brecht) closed T63698: Selecting Materials after creating a new file throws EXCEPTION_ACCESS_VIOLATION as Resolved by committing rBc8fc23fdbe09: Fix T63698: Eevee crash after recent clang-format changes. Christopher Anderssarian (Christopher_Anderssarian) updated subscribers of T63772: Movie Clip Editor fails to show/hide toolbar. @George Vogiatzis (Gvgeo) If your going to triage reports then it's best to assign them to the respective developer and not just mention their usernames, as notifications get overlooked. François (fanfan70) created T63778: emissive ignored when importing .obj. Yu-sion (Yu-sion) updated subscribers of T63698: Selecting Materials after creating a new file throws EXCEPTION_ACCESS_VIOLATION. Can confirm this (T63698) and T63760 are related. As promised, I just got done doing a bisect search, and every time that clicking Materials caused a crash, selecting either Rendered or LookDev display modes would also cause a crash. They also both give me the exact same error output from the debug cmd scripts. Serj Maiorov (printerkiller) created T63777: Particle hair - Simple children with UV textures produce black materials, unlike interpolated. Brecht Van Lommel (brecht) raised the priority of T63751: when i open blender beta it chashes at start from Needs Information from User to Needs Triage by Developer. kevin (dregter) added a comment to T63751: when i open blender beta it chashes at start. George Vogiatzis (Gvgeo) triaged T63772: Movie Clip Editor fails to show/hide toolbar as Confirmed, Medium priority. @Campbell Barton (campbellbarton) I'm guessing the problem is 6aef124e7d28. It was fine with b46245470f79 build. Essi Hagman (essi) created T63776: Undo in shader editor doesn't work if texture paint is open. vidhiyasagar (vidhiyasagar) added a comment to T63760: Crashes while rendering or changed to lookdev mode. George Vogiatzis (Gvgeo) raised the priority of T63760: Crashes while rendering or changed to lookdev mode from Needs Information from User to Needs Triage by Developer. Oh nice @Yu-sion (Yu-sion), it looks as duplicate of T63698. I wonder if screen space reflections problem T63512 is also the same. Wolfgang Geithner (wgeithner) added a comment to T63747: Blender crashes at switching to Texture view. Jacques Lucke (JacquesLucke) claimed T63649: action.groups.show_expanded datablock is broken. Yu-sion (Yu-sion) added a comment to T63760: Crashes while rendering or changed to lookdev mode. I was browsing through and found this thread. I reported the same issue here a couple of days ago. 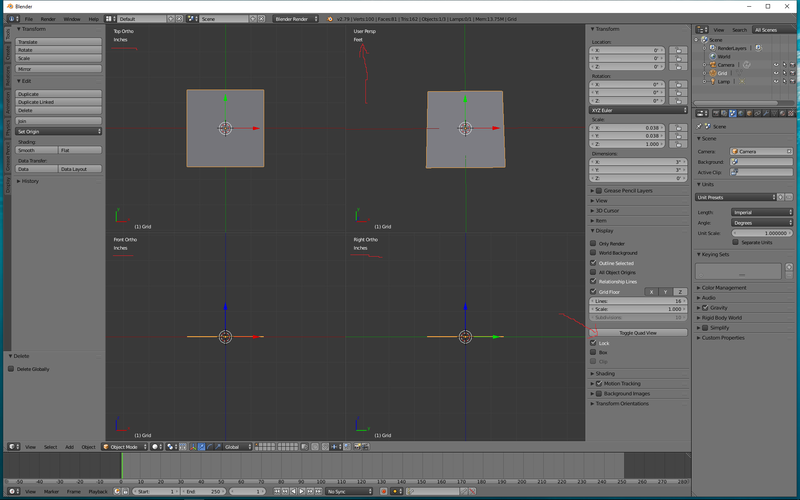 Shane Ambler (sambler) created T63775: Toolbar icons do not honour BLENDER_SYSTEM_DATAFILES. Kent Davis (mac4kent) created T63774: Cycles and EEVEE on Mirror Blender 2.80.
vidhiyasagar (vidhiyasagar) added a comment to T63512: crashes when clicking screen space reflections . Sekhar Ravinutala (sekhar) created T63773: Broken edge lines with boolean and freestyle. Shane Ambler (sambler) created T63772: Movie Clip Editor fails to show/hide toolbar. laiden day (laiden) created T63771: Black scene and random crash . JoshBowman (JoshyB) merged T63770: Grease Pencil tool leaves blobs at the end of strokes into T63769: Grease Pencil tool leaves blobs at the end of strokes. JoshBowman (JoshyB) merged task T63770: Grease Pencil tool leaves blobs at the end of strokes into T63769: Grease Pencil tool leaves blobs at the end of strokes. JoshBowman (JoshyB) created T63770: Grease Pencil tool leaves blobs at the end of strokes. JoshBowman (JoshyB) created T63769: Grease Pencil tool leaves blobs at the end of strokes. Zino Guerr (Zino) added a comment to T63516: Move tool settings bar to editors. i would like to point out that moving "Mode and select mode..etc" to the tool settings bar is not ideal and here is why. frew frew (frew) updated the task description for T63768: Spotlight very close to tiny cube shines through the cube. frew frew (frew) created T63768: Spotlight very close to tiny cube shines through the cube. Brecht Van Lommel (brecht) added a project to T63726: User Interface Module : User Interface. Brecht Van Lommel (brecht) added a project to T63757: Grease Pencil Module: Grease Pencil. Brecht Van Lommel (brecht) added a comment to T63649: action.groups.show_expanded datablock is broken. There is no need to be consistent with obscure internal names, the Python API should have readable names. Brecht Van Lommel (brecht) raised the priority of T63660: Data Transfer No Longer Working from Confirmed, Medium to Confirmed, High. Brecht Van Lommel (brecht) closed T62005: Rigid bodies and constraints not working after append as Resolved. @Dalai Felinto (dfelinto), so there was an actual bug that cause existing objects to lose rigid body data, that was fixed in rBe760d37733e4: Fix T62913: datablock append removing unrelated rigid body objects..
Brecht Van Lommel (brecht) closed T55846: Scene: Simplify - Texture resolution limiter breaks microdisplacement as Resolved. Appears to work fine for me now. If it still doesn't work, we need a .blend with texture included, even if it's not the real one from the original file. Brecht Van Lommel (brecht) closed T62408: opensubdiv crash in rendered viewport as Resolved by committing rB8982f0cfee41: Fix T62408: Cycles viewport adaptive subdivision hangs after updates. Brecht Van Lommel (brecht) closed T63431: Adding Driver to Keyframed Parameter Crashes Blender as Resolved by committing rB1de3c81d268b: Fix T63431: crash adding driver to a keyframed property with Ctrl+D. Brecht Van Lommel (brecht) closed T63415: Cycles -- OSL Script -- Displacement does not update when pressing "Script Node Update" as Resolved by committing rB543614a17d23: Fix T63415: no Cycles displacement update when updating OSL code. Brecht Van Lommel (brecht) lowered the priority of T62258: Redo panel overlaps part of the interface from Confirmed, High to Confirmed, Medium. Not as high priority since it can be hidden now from the View menu, still should have some automatic fix for this. Brecht Van Lommel (brecht) closed T63579: Problem of selection as Archived. Closing due to lack of information to investigate the issue, possible duplicate of T62947: Box selection not working with Intel HD Graphics 620. @Sebastian Parborg (zeddb) I just wanted to let you know I haven't forgotten, but as I do C# programming I don't have the C++ workload downloaded for MSVS 2017, and my connection isn't exactly the fastest. But I will try to get it done over the weekend. Brecht Van Lommel (brecht) raised the priority of T63443: tool 'builtin_brush.draw' not found for space 'IMAGE_EDITOR' from Confirmed, Medium to Confirmed, High. Brecht Van Lommel (brecht) raised the priority of T63528: Alembic Export Error from Needs Information from User to Confirmed, High. I can confirm this on macOS. Brecht Van Lommel (brecht) triaged T63528: Alembic Export Error as Needs Information from User priority. Brecht Van Lommel (brecht) closed T63681: Report a Bug popup as Resolved by committing rBa5d5f152dd31: Fix T63681: bad clipping of very long tooltips.